Promises, promises. Each passing day seems to bring yet another outlandish promise from yet another 2020 presidential candidate - usually laced with that magical, seductive four-letter word: FREE. "Free Medicare for all," promises Democratic Socialist Representative Alexandria Ocasio-Cortez, with at least five other democratic presidential hopefuls chiming in with the same promise. "Free college for all," promises Socialist Bernie Sanders in his proposed College For All Act, which he claims will provide $47 billion per year to states and eliminate undergraduate tuition. "Free Social Security for all," promises Democratic New York Senator Kirsten Gillibrand, along with her pathway to free citizenship for all immigrants “in the country now”. "Student loan debt freedom for all," promises Democratic Presidential candidate Wayne Messam, who proposes to wipe out $1.5 trillion in debt for 44 million students. In addition to these freebies, Senator Elizabeth Warren promises a 2% "Wealth Tax" on citizens with a net worth over $50 million, meanwhile New Jersey Senator Corey Booker has promised a national $15 Minimum Wage. Clearly these promises by democratic candidates revolve around the most politically expedient, yet virtually impossible word to deliver on: FREE! 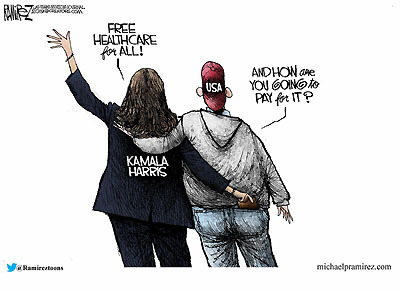 The truth is, there is no such thing as a "free for all" government program, every freebie must be paid for in one of two ways; more taxation or more borrowing. Socialism promises a lot, but delivers little. Ask any Venezuelan. Is it possible for a healthy nation, pioneered and led by free market capitalists, to co-exist with a strong push toward economic socialism? Will previously prudent, capitalist investment strategies now become high-risk socialist gambles? The answers to these questions may well be decided between now and November 2020 as our nation engages in a serious debate over the merits of capitalism vs. socialism. The truth is, America is presently at a tipping point -having traveled nearly halfway down the road to socialism over the last century. No wonder wise American investors are hedging their future by diversifying their investment strategy to reflect the new risks socialism may bring to our savings. My recommendation: follow the leaders. Big money is banking on the safety of gold. Billionaires who’ve been buying gold recently include; Ray Dalio, founder of Bridgewater Associates; Jeffrey Gundlach, CEO of Doubleline; David Einhorn, founder of Greenlight Capital and real estate mogul Sam Zell, founder of Equity Group Investments. What are these wise investors preparing for? With capitalism under fierce fire by socialism in 2020, they understand the importance of owning gold as wealth insurance. Historically, when politicians begin promising more and more short-term freebies, the wise respond by adding more physical gold to their long-term portfolio. Read the full story in my latest complimentary White Paper, Protecting Your Wealth in Today’s America by calling 800-289-2646.